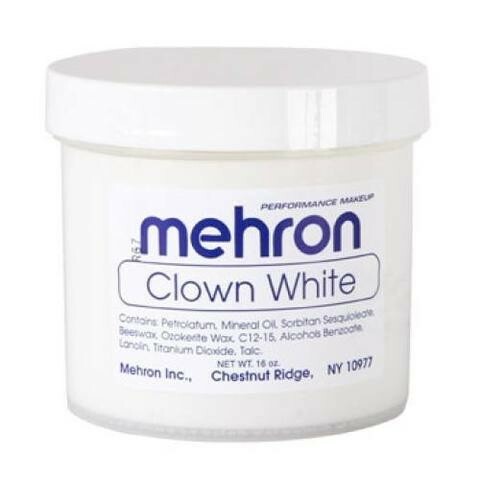 Consistency in quality and coverage are what makes Mehron’s Clown White the first choice of professional clowns and mimes. This super smooth, ultra-white cream covers efficiently without dryness or cracking, even under the most demanding performance conditions. Mehron uses a high concentration of titanium dioxide and formulates the base to a smooth, easy to work with consistency. Mehron product code #130-XL. Definitely yes Likely Not sure Unlikely Never! Easy returns for incorrect size, or unwanted items. We understand what it is like to buy items online. Sometimes it is hard to work out whether an item will fit correctly or not. And sometimes you just change your mind. Therefore we have a no hassle returns policy. Simply request your return via your account (log in here) and we will organise it with you. Standard Delivery is 1-5 days to most locations throughout Australia. Express Delivery is 1-2 days to most locations throughout Australia. Delivery times may be longer for some rural or remote areas of Australia. For an accurate estimate of delivery times, add items to cart, and your postcode in checkout.